Homemade cranberry sauce recipe in less than 20 minutes made with sweet maple, orange and vanilla spices. 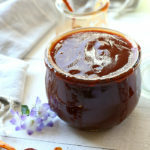 Perfect for any time of the year with Thanksgiving or Christmas dinner or topped on crackers for a summertime barbecue! Forgive me for sending this recipe four days after Thanksgiving instead of prior, although now we all have it in time to spread on leftover turkey salad sandwiches and for a Christmas feast! This homemade cranberry sauce is so delicious and takes little time and is so much healthier than store bought or canned cranberry relish or sauce. 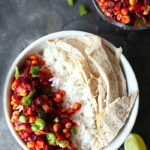 We made it again this year for Thanksgiving and it was a big hit with the cranberry lovers in our house! I photographed the recipe with thyme and sage because cranberry sauce goes so well with those flavors. You can add a little sprig of fresh thyme to recipe during cooking for a little more robust taste. Each year during the holidays my mom has one BIG MUST HAVE request anytime she has turkey. Can you guess what it is? Yes, cranberry sauce! I can’t wait to make this for her at Christmas when she visits! Same goes for my mother-in-law too. She just loves a good turkey and sandwich smothered in the tangy rich red sauce. Not only is cranberry sauce delicious with turkey and amazing in sandwiches, but it is also great stuffed in pies, baked goods and homemade pop tarts! But I have always had a hard time choking down store bought “jello-like” canned cranberry sauce, which is what I grew up on. It made me not a fan of cranberry sauce until I started making my own because canned always tasted super tart. 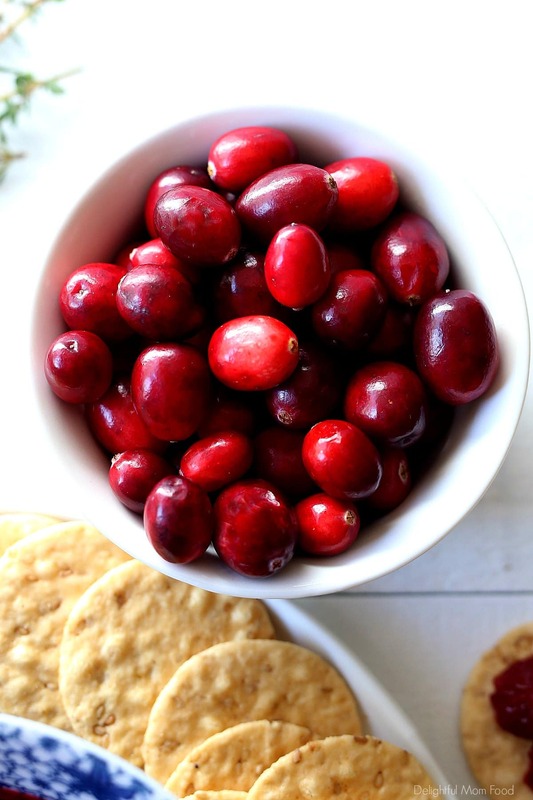 Homemade cranberry sauce is so much better in texture and flavor all around! It sorta has a chunky cranberry chutney consistency with bursts of sweetness and tart flavors all around. Along with the flavors being amazing, fresh cranberries are so healthy for you as they are rich in fiber, vitamin C and antioxidants! To make, use a small pot to simmer the ingredients together. Add a 12 ounce bag of fresh cranberries, orange juice, maple syrup and vanilla. Let it cook on medium high heat to boil slightly then turn the heat down to simmer to get rid of some of the liquid. At this point you will soon start the hear the cranberry’s POP! I wasn’t quite sure what as going on in my kitchen the first time this happened until I found out it was normal! After the sauce cooks I like to let it set and cool for a bit. As the sauce sets it will start to become thicker and more gelatin-like. After it cools mash it a bit with a meat tenderizer or a potato masher to thicken it and smooth the chunks. Either serve this cranberry sauce recipe by transferring it with a slotted spoon (to remove extra fluid) to a serving bowl or store in an airtight container int he refrigerator. 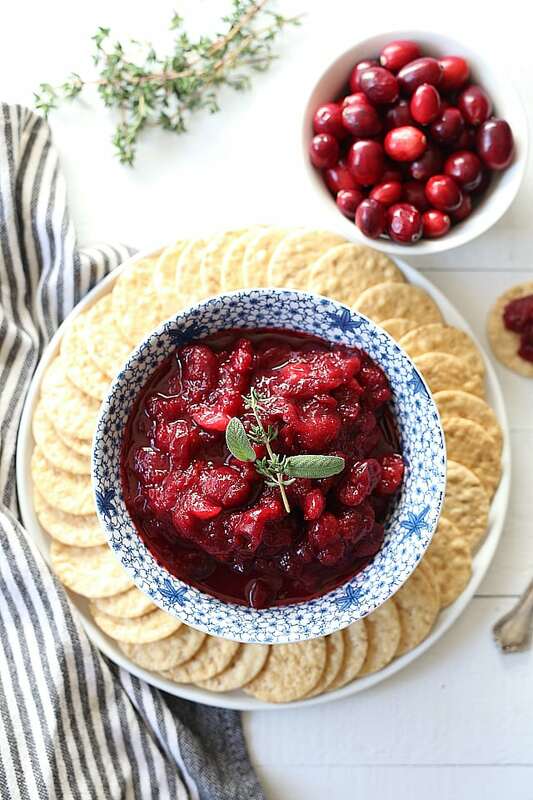 I promise you are going to love this and once you try this amazing homemade cranberry sauce recipe you will never want to buy store-bought again! In a small sauce pan add the cranberries, orange juice, maple syrup and vanilla. Bring to a boil then turn the heat down to medium low. The cranberries will start to pop. Heat for about 10-15 minutes. With a potato masher or meat tenderizer press down on the sauce to pop anymore cranberries. 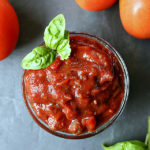 Using a slotted spoon (to remove any access water), scoop into a serving bowl or store into an airtight container for up to a week.